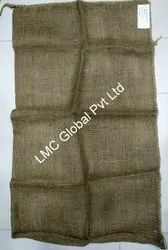 LMC Natural 50 Kg Potato Bag, Size: 40"x 24"
We are offering Jute Potato Bag to our Client. Hessian Bags For Potato, Onion, Garlic, Vegetables, Etc are available in all qalities and sizes as per requirements of the buyers.We can provide Printed & Non-Printed Bags for Bulk orders and Reatail. - All Types of Bag qualities are available as per season and requirement. - Rs. 7 to 15 per piece. We manufacturer 25 & 50 kg Potato Bag made of jute and is natural/full bright with multicolor logo. Measurement of the bags: 25 kg Potato Bag  32" X 20" 25 kg Potato Bag  34" X 20" 50 kg Potato Bag  22" X 48" 50 kg Potato Bag  24" X 40"